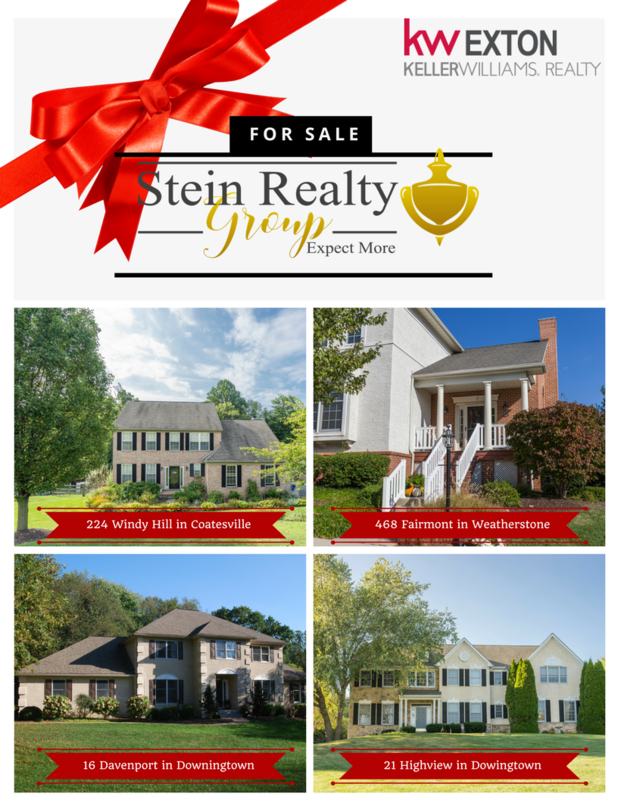 The Stein Realty Group believes that the right marketing strategy makes all the difference. We go above and beyond to market your home using all the latest advancements in technology, social media, and publicity strategies to ensure your home reaches the maximum number of potential buyers. More buyers means more offers, bidding wars, and ultimately, more money for you. Where Buyers Come From: By studying where and how buyers find the home they purchase, we've created our marketing and prospecting plans to ensure every single buyer who could possibly buy a home like yours knows your home is for sale. In fact, we are 100% confident that NO ONE can expose your home to the masses like we can! 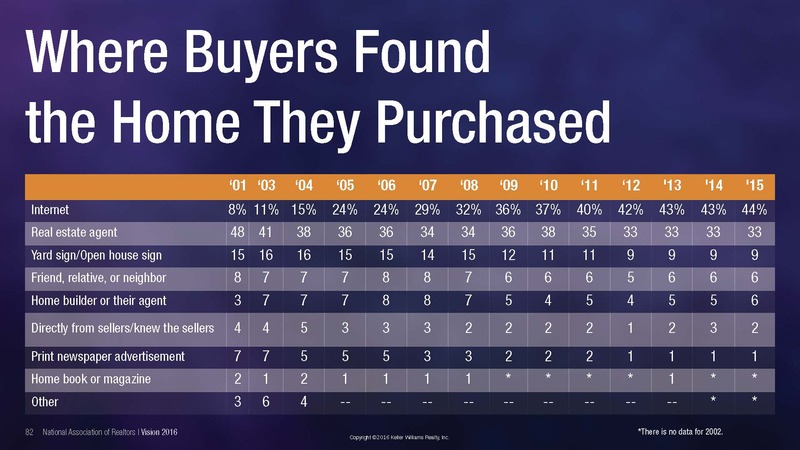 This graph comes from the National Association of Realtors annual study of home buyers and sellers. Since 76% of buyers find their home online (including apps and social media) and through their realtor, we focus heavily on these sources without ignoring the rest! A complimentary consultation with a professional stager. A complimentary home cleaning service. Professional photographs and videos scheduled to be taken of your home. A market analysis of current competitors, pending sales, and recent comparables to establish the price that would maximize the sale. Room-by-room analysis of your home to see it through the eyes of a buyer. In depth demographic study of your home and neighborhood to determine where your best buyer will likely come from. Access to our list of preferred vendors if any work needs to be done prior to listing your home for sale. If the home is vacant/unfurnished, we provide virtual staging. Video walk through of the home. Aerial video of the home. Your home's virtual tour will be uploaded to our YouTube channel. YouTube is the world's second largest search engine, after Google! Once your photos are completed, we're able to launch your home's own website and immediately promote it. Photos editing and retouching available! Brown lawn? Cracked driveway? No problem! Facebook boosted/promoted posts that reach between 1,000 and 5,000 people. 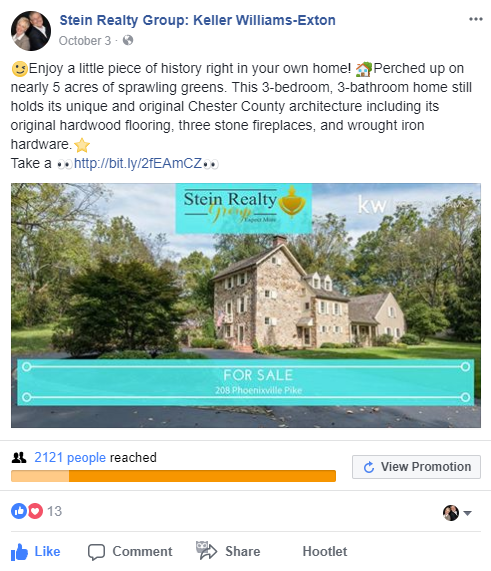 Our Facebook page has an audience of 800 followers, more than 99% of real estate agents in the area. Twitter, LinkedIn, Instagram, and Pinterest promotions. Video tour placed on our YouTube Channel and tagged for maximum views and with a link to your home's custom website. We will announce your home to our database of nearly 10,000 people, including potential buyers and every agent in town, via a customized email blast with photos and link to your website. Additional email blasts as needed. All blasts include photos, videos, and links to your custom website. Since we can see who opens the emails AND who clicks the link, we can then target email campaigns about the home on your specific audience. This website comes with information capture, so we know who has been looking at your home and can contact them to tell them about it! Premium Placement on Zillow, Trulia, and Realtor.com. 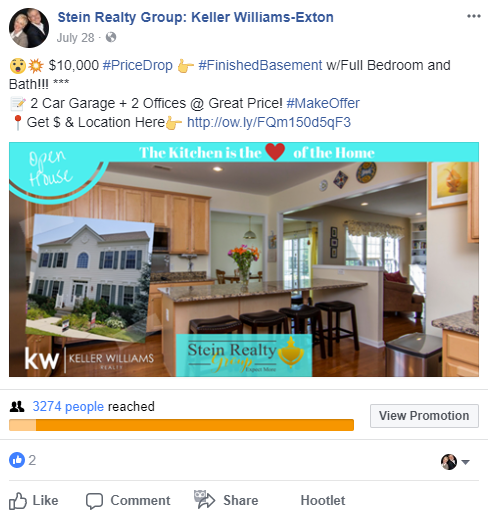 Your home will be entered on MLS and KWLS (Keller Williams Listing System), from which it will be syndicated to over 1000 searchable websites and 125,000+ agent web pages worldwide. We'll also host a Premium Open House the first weekend your home is on the market. Consists of: 100-200 phone calls, 1000-2000 voicemail broadcasts, 50 invitations hand delivered to your neighbors, additional facebook and email promotions, refreshments served, an agent present for personal tours. It's the best way to generate a sense of competition in buyers and start a bidding war! 3000-4000 phone calls and voicemail broadcasts made by our team of inside sales associates to promote the website to the following: 1) your neighborhood 2) all the top agents in the area who are likely to represent your buyer 3) neighborhoods most likely to purchase in your neighborhood, as determined by demographic studies and 4) every buyer/buyer lead in our database who's criteria the home fits. Door knocking the 100 closest homes to yours with info on your home in hand. Customized signage with up to 12 directional signs strategically placed. Postcard campaign with 500 cards sent to homes in your neighborhood, announcing the listing and promoting your home's custom webpage. Full color magazine-style books (similar to our seller guide) created for your home and delivered to a targeted group of buyer prospects, neighbors, and agents. Full color brochures and flyers created and distributed. We can track who visits your webpage from our offline marketing. These are normally your hottest prospects (versus the ones who simply click through to see). We can even see who's looking at your home online in REAL TIME! Listing Power Tool's full range of marketing materials orderd and customized for your home, including thick stock, glossy flyers with color photos, folding business cards, postcards, thank you cards, sign riders with a unique phone number, and texting/SMS services with unique text number. Personalized concierge center to schedule showings and assist in gathering feedback from buyers and agents. Structured processes to maximize the amount of feedback we get from showings (4X's text, 4X's call, 4X's email). Industry average is 25%, and we receive feedback from over 80% of our showings! Structured communication system to ensure you receive all showing feedback, market updates, and marketING updates. You will never feel like you're in the dark. Daily prospecting by our team of inside sales agents, who make about 500 contacts every week promoting our home listings. Professional closing coordinator once we're under contract.